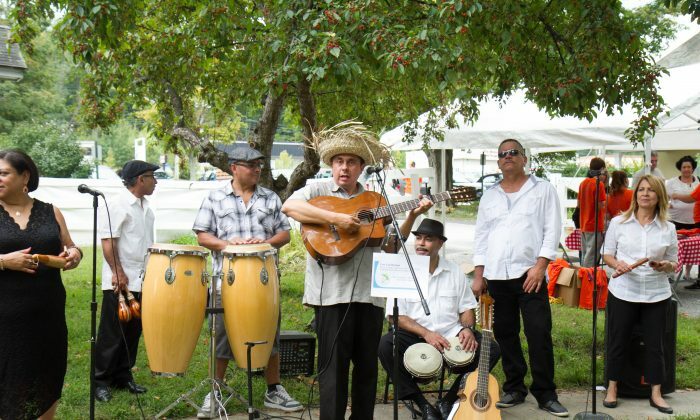 MONROE—The inaugural Hudson Valley Fiesta Latina on Sept. 12 may be the first of a long partnership with Museum Village. Rubén Estrada, the chairman of the Latino National Republican Coalition of New York, came up with the idea because he feels children today don’t know a lot of important history, and he hopes this will get them interested. “I really think that Americans that come here, even those who are not documented, they should learn how rich our history is because that’s what makes us great,” he said. The event kicked off with a 5K race and walk to benefit cancer research called Mialgros for Colon Cancer. Milagro is the word “miracle” in Spanish as well as the name of the wife of the race organizer, who died of rectal cancer in May. There were also vendor booths ranging from utility and car companies to jewelry and face painting. Hour-long yoga lessons were given throughout the day and costumed interpreters were on hand to demonstrate daily life in the 19th century. Two interpreters portrayed the life of Loreta Janeta Velásquez, a Cuban aristocrat who disguised herself as a man and fought in the Civil War. Although the Latino National Republican Coalition of New York was the presenter, Estrada said the focus was on celebrating history and Latin culture, not politics. Several prominent Latinos in the community received awards of recognition from the Fiesta Latina at Museum Village Committee. Richard Vasquez, the Chief of police in Woodbury, was honored with the “Con Orgullo Lo Nuestro” award, as was the Commissioner of Health for Orange County, Eli N. Avila. A little before two o’clock it started to rain and then pour. Despite the downpour, people kept coming, especially once Willie Colon, a Grammy award-winning Salsa trombonist, arrived. The proceeds of the fiesta went to three charities: The American Cancer Society, the Pentecostal Church Assembly of God in Middletown, and Museum Village, a non-profit. Estrada, who lives in Chester but used to be a resident of Monroe, said he hopes this is the beginning of a tradition of Fiestas Latinas at Museum Village.